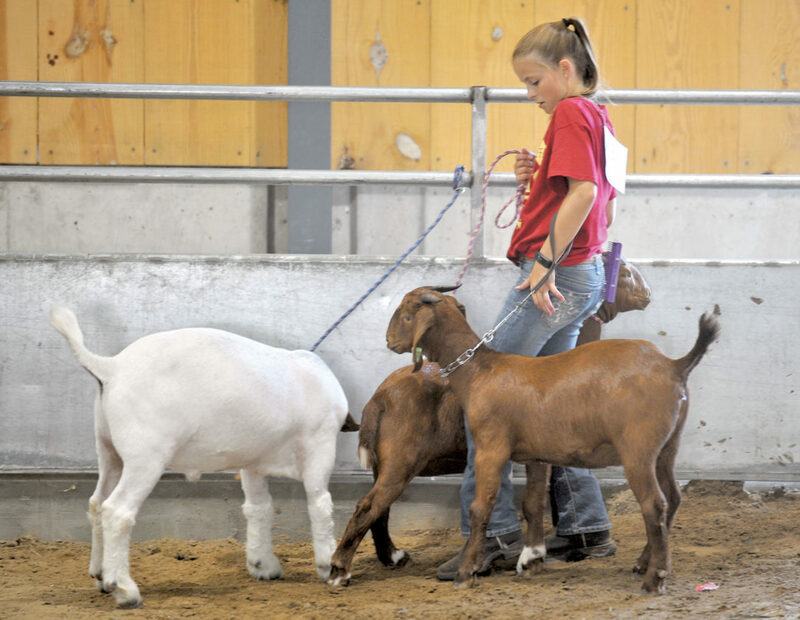 -Messenger photo by Hans Madsen Cody Zimmerman, 11, of Ellsworth, has her hands full with a small herd of goats Thursday afternoon at the Hamilton County Fair following the 4-H-FFA Goat Show. 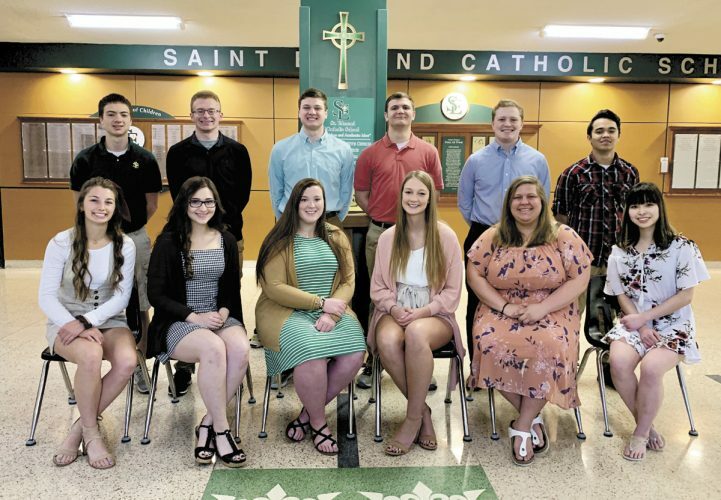 Zimmerman is a member of the Clear Lake Sailors 4-H Club. -Messenger photo by Hans Madsen Randy Greenfield, of Kamrar, looks over some new equipment with his grandson Waylon Greenfield, 1, also of Kamrar at the Hamilton County Fair Thursday afternoon in Webster City. 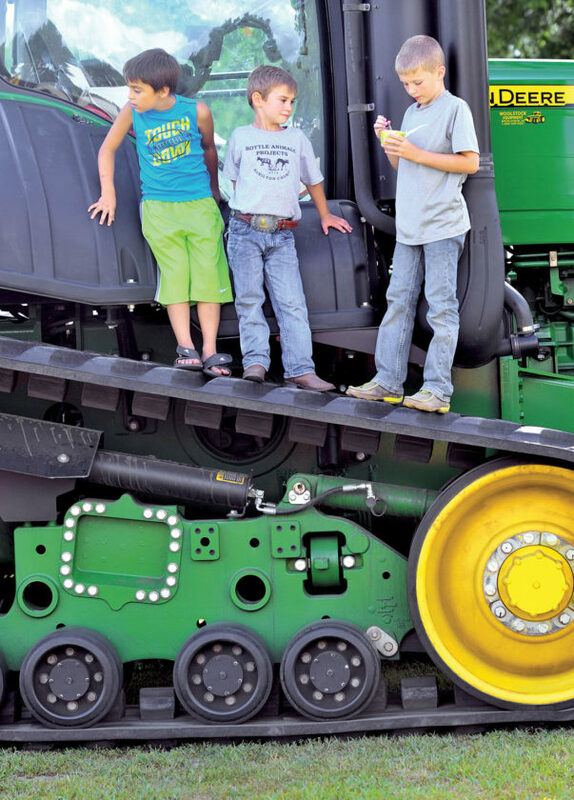 -Messenger photo by Hans Madsen Carsyn Hartmann, 8, of Story City, at left, along with Luke McCoy, 5, of Webster City and Trevyn Orton, 9, of Webster City, at rigth enjoy some time atop the treads of a tractor on display at the Hamilton County Fair Thursday afternoon in Webster City. -Messenger photo by Hans Madsen Alexandria Schweria, of Jewell, a member of the Lion Kings 4-H Club, helps out with the 4-H Horse Show Thursday afternoon at the Hamilton County Fair. She’s also a Fair Queen candidate. 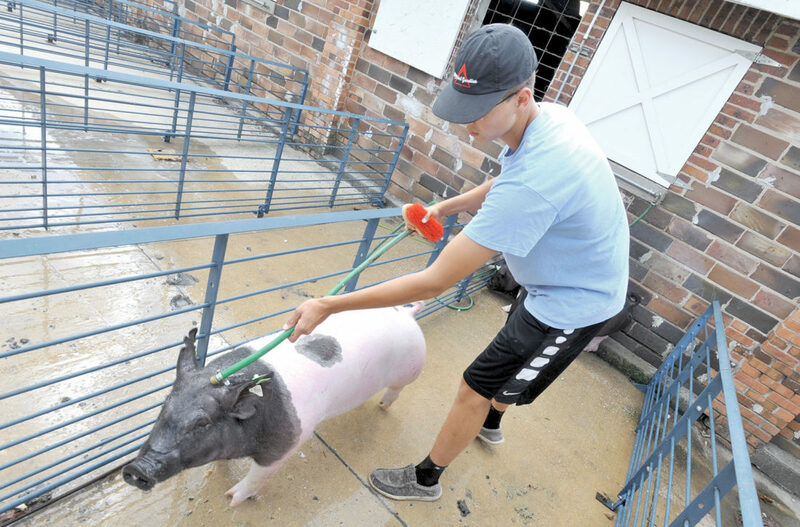 -Messenger photo by Hans Madsen Ben Heeren, 17, of Stratford, makes sure one of his pigs gets a good bath Thursday afternoon at the Hamilton County Fair in Webster City. Heeren is a member of the Stratford Spirit 4-H Club. 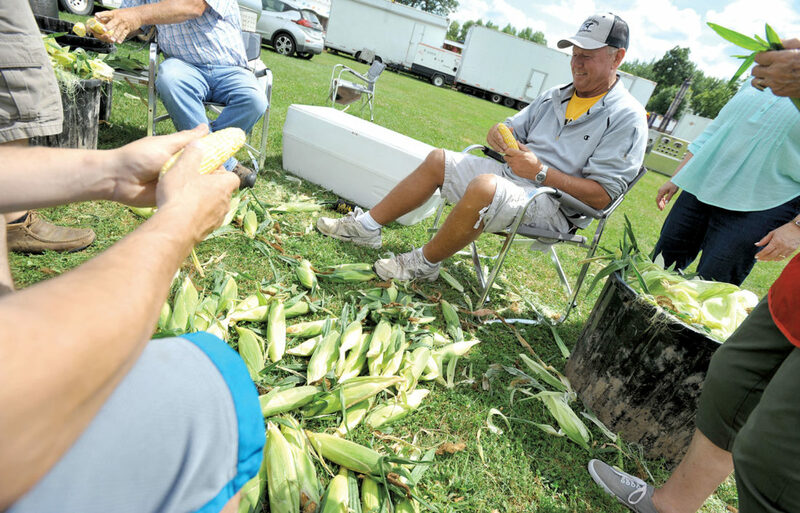 -Messenger photo by Hans Madsen president of the Hamilton County Cattlemen’s Association, works on shucking corn Thursday afternoon at the Hamilton County Fair in preparation for their evening’s meal. -Messenger photo by Hans Madsen Governor Kim Reynolds shares a high five with Caroline Ehn, 11, of Webster City during the Governor’s visit to the Hamilton County Fair in Webster City. Ehn will have a steer in the Governor’s Cattle Show at the Iowa State Fair. -Messenger photo by Hans Madsen Governor Kim Reynolds stop to visit with Vada Williams, 5, of Webster City about her bottle animal project during Reynolds’ visit to the Hamilton County Fair Thursday afternoon. 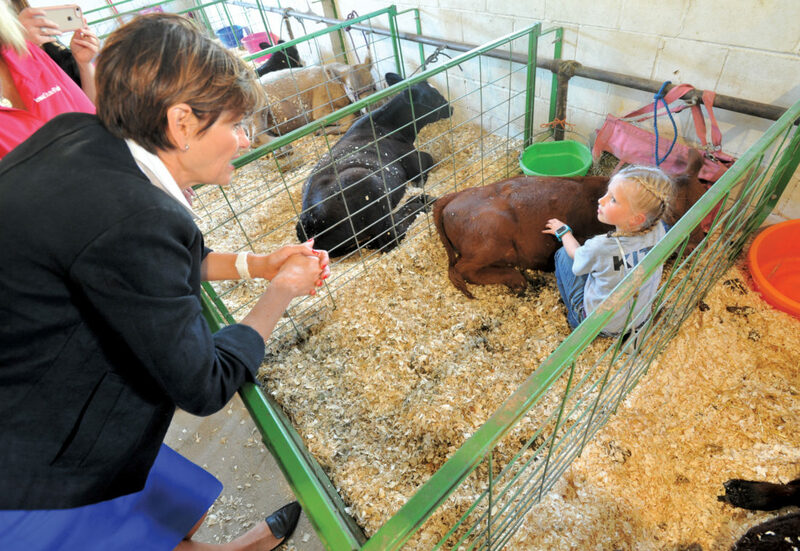 -Messenger photo by Hans Madsen Governor Kim Reynolds stops to chat with Kearsyn Kite, 7, of Webster City, about her bottle calf Rosay during Reynolds’ visit to the Hamilton County Fair Thursday afternoon. -Messenger photo by Hans Madsen Seth Godfredsen, 14, of Webster City, a member of the Clear Lake Sailors 4-H Club rides in a Western Saddle event Thursday on his horse Ninja at the Hamilton County Fair. 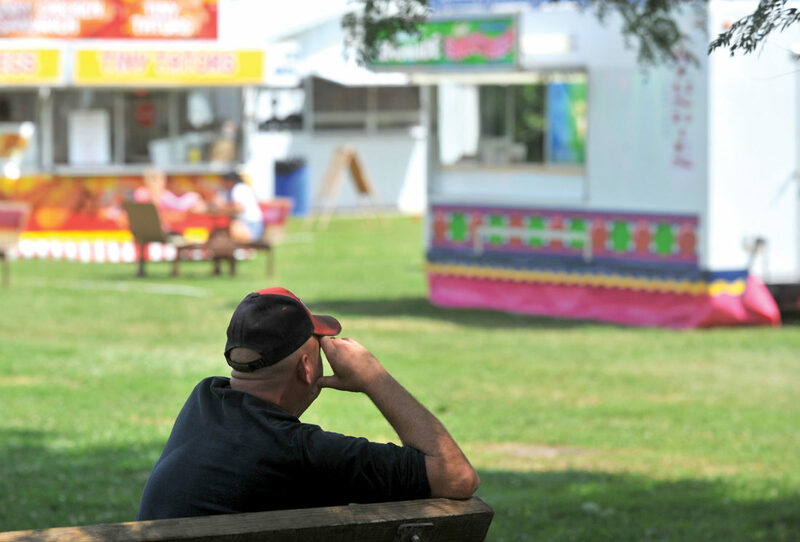 -Messenger photo by Hans Madsen Rick Clabaugh, of Webster City, takes time to relax and take in the scenery Thursday afternoon at the Hamilton County Fair in Webster City. -Messenger photo by Hans Madsen David McGuire, of Webster City, tosses a crushed can into his trash train Thursday afternoon at the Hamilton County Fair. His daughter, Saundra McGuire, waits in the golf cart. 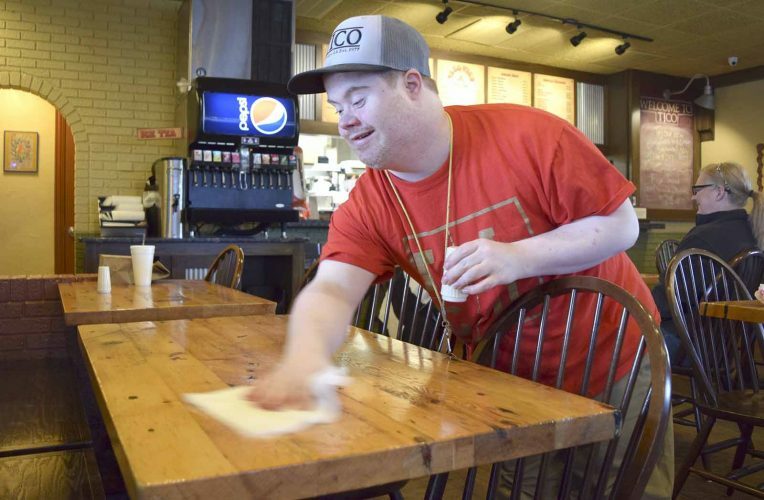 The pair clean the fairgrounds during the annual event. 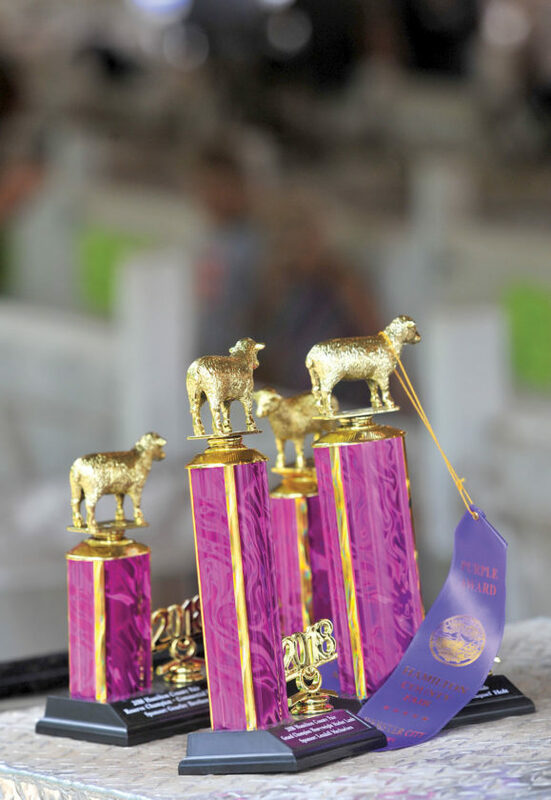 -Messenger photo by Hans Madsen A set of trophies and ribbons from the Sheep Show await the trip home Thursday at the Hamilton County Fair. -Messenger photo by Hans Madsen Daytan Oberender, 9, watches as her mom, Kristie Oberender, of Jewell, works on drying Izzy the sheep Thursday afternoon at the Hamilton County Fair in Webster City. WEBSTER CITY — Iowa Gov. Kim Reynolds arrived hungry at the Hamilton County Fair Thursday afternoon, her busy schedule having left no time for a proper meal. The fair offered a lot of options. “I’m going to scope it out,” she said. After visiting with several 4-H participants and looking over some of the many animals, Reynolds finally got her lunch break. Opting to eat at the 4-H food stand and selecting the always-good-choice: the Red Hot Meal Deal. 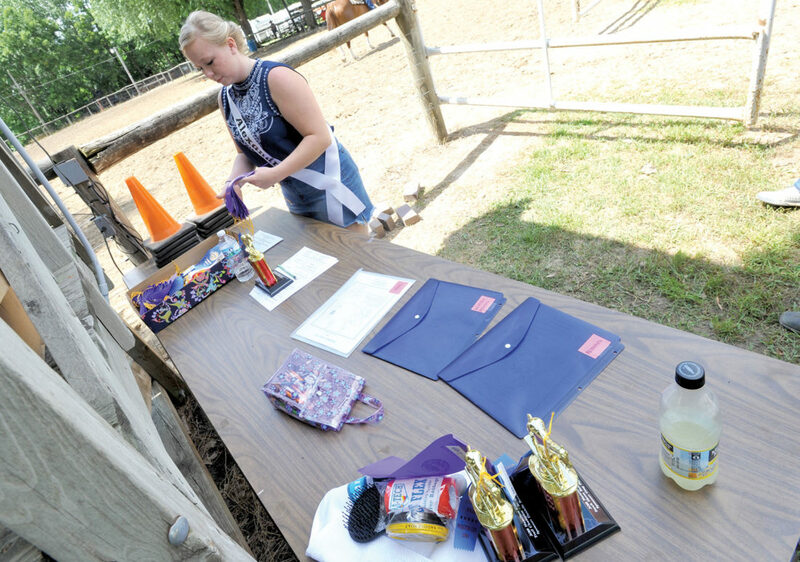 The fair was a busy place Thursday — several 4-H shows were scheduled, including the Horse Show. Fair Queen candidate Alexandria Schweria, of Jewell, a member of the Lion Kings 4-H Club, was on hand to help. She was, to the best of her knowledge, the only candidate on the grounds. “All the other girls are getting their hair done,” she said. She had plenty of other shows to help with. “Yesterday I worked the Sheep Show,” she said. Were she selected to be the 2018 Hamilton County Fair Queen, she planned on going on as she has during the fair by volunteering her time. 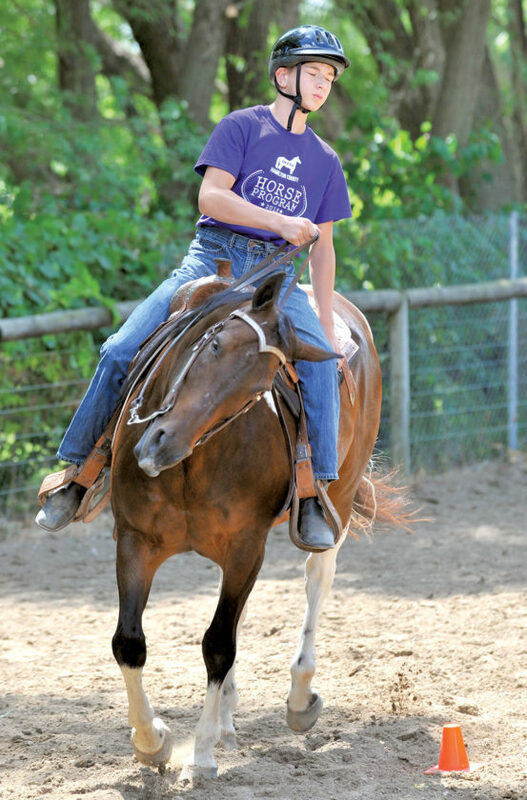 One of the participants in the horse show was Seth Godfredsen, 14, of Webster City. 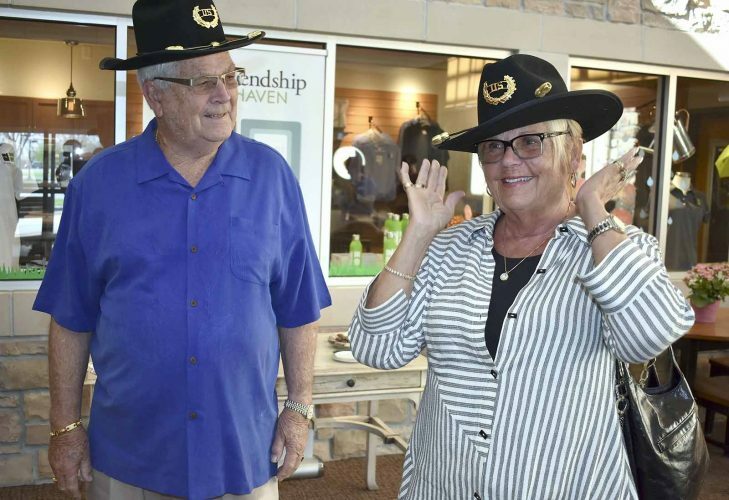 He’s a member of the Clear Lake Sailors 4-H Club. During one of Thursday’s events, he had to negotiate a set of cones with his horse, Ninja. The map the participants were given looked complicated. “I had to figure out all the paths,” he said. Godfredsen said he and Ninja work together several hours a day to keep their skills sharp. The fair is also a social occasion for him. Once they were back in the horse barn, Ninja was in for a special treat. “I usually give her a peppermint candy treat,” he said. 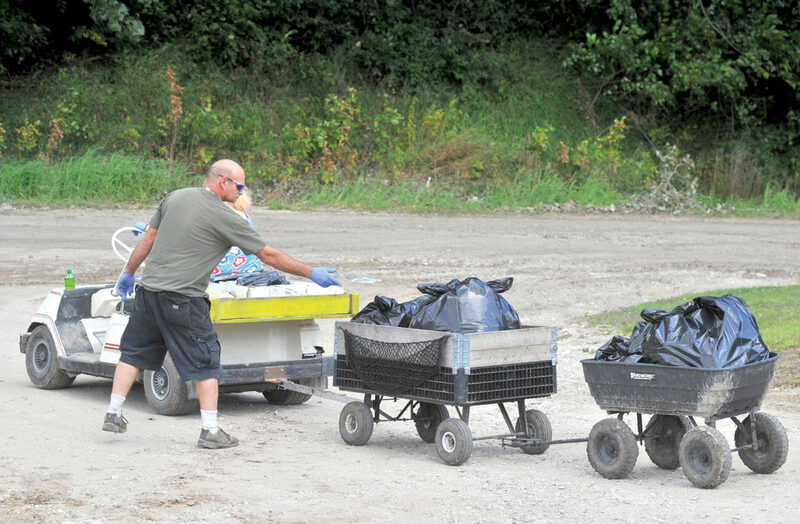 Keeping the fairgrounds clean and collecting the garbage from the many wastebaskets is the job of David McGuire, of Webster City, and his daughter, Saundra McGuire. The two have small wagons hooked behind a golf cart to haul their collected waste. So far this year, nobody seems to have left them anything too out of the ordinary. “It’s pretty much ordinary trash,” he said. “We did find a pair of pants, though,” she said. Ben Heeren, 17, of Stratford, a member of the Stratford Spirit 4-H Club, was giving two of his pigs a bath Thursday afternoon, and the anonymous porkers seemed to be enjoying the cool water. Heeren stays on the fairgrounds in a camper with his family. He very much enjoys his time there. For the adults who visit the fair, especially those who farm or who just enjoy equipment, there’s plenty on display. 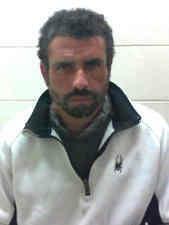 Randy Greenfield, of Kamrar, was among those kicking some tires. 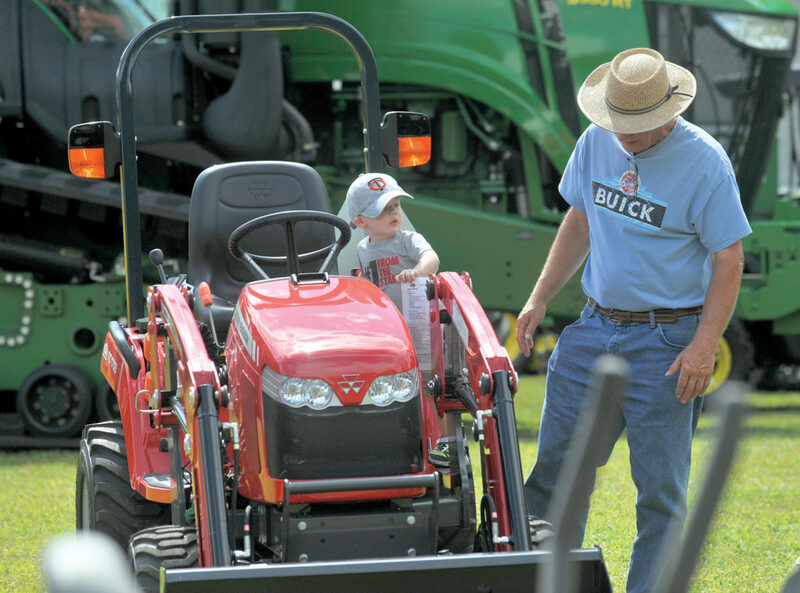 Greenfield was looking over tractors with his grandson, Waylon Greenfield, 1, of Story City. The younger Greenfield, so far, had not discovered a piece of gear he absolutely had to have — except maybe all of it. Camy McCoy, of Webster City, was watching her son, Luke McCoy, 5, climb atop the treads of a large tractor with several other children. She was planning her culinary adventure at the fair carefully.